March 11: Upon the completion of the Senate of Pakistan’s Parliamentary year, PILDAT has lauded the Senate in joining the global ranks of democratic and legislative transparency. Under the leadership of the Honourable Senator Raza Rabbani, Chairman of the Senate, who vowed to restore the “majesty and transparency of Parliament”1 upon his election in April 2015, the Senate has taken important initiatives to set new standards of Parliamentary efficiency and discharge of its responsibilities. In its analysis of the performance of the Senate during the year, PILDAT notes that the highlight of the Senate performance has been the attendance of Senators in the sessions, which was higher as compared to any other legislature of Pakistan with an average of 60% Senators being present per sitting.2 It is marginally higher than attendance in the National Assembly, which is currently averaging at 58% in its 3rd year. However, in comparison, the attendance of Members in the Indian Rajya Sabha is far superior; averaged at 81% per session in 2015.3 Unfortunately, the presence of Ministers in the Senate left much to be desired as they were hardly present in the House and have even been barred from enterring the House by the Chairman. The Prime Minister of Pakistan, Mr. Nawaz Sharif, MNA, for instance, attended only 1 of 103 sittings in the entire year. The PM even violated Rule 61(2A) that had been amended by Senators in 2014 to make it mandatory for him to attend the Prime Minister’s Zero Hour (last hour of sitting) at least once a week during a session. In comparison, the Leader of the House and Leader of the Opposition each had praiseworthy attendance records of 76% and 68% respectively. There also appears to be more interest in the legislative work by the membership as reflected by increasing number of Private Members’ Bills tabled during the year. 18 bills have been introduced in the Senate: 64% more than the previous year (11). 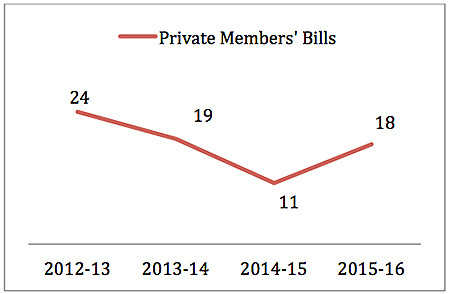 In comparison, Rajya Sabha saw its members introduce 52 Private Members’ Bills in the 2015 Calendar year. The Senate is taking seriously its oversight duties over the Executive by amending its rules to give powers to the House to constitute itself into a Committee of the Whole and summon Government officials or ask for any official record. This was done through the newly inserted Rule 172(A) in the Rules of Procedure and Conduct of Business in the Senate in April 2015. The Committee of the Whole on Speedy and Inexpensive Justice met proactively over the 13th Parliamentary year and issued a highly comprehensive report when the House referred the prevailing issue of the provision of justice to the committee. The Senate Standing Committee on Finance, Revenue, Economic Affairs, Statistics and Privatization also took its oversight duties seriously, meeting 38 times over the year. On the other hand, the Senate Standing Committee on Ports and Shipping led by its Chairman, Senator Muhammad Ali Khan Saif, MQM, met only twice: the lowest of any Senate Committee. Legislators accorded significance to matters of public interest by amending its rules so that instead of one Calling Attention Notice, two Calling Attention Notices would be taken up daily during the session. The House is also taking up matters suo moto in the larger public interest. On June 11, 2015, the Chairman took note of the Indian Prime Minister’s statement that Pakistan is responsible for promoting terrorism4 and suspended the discussion on the Finance Bill for 45 minutes in order to enable the House to have a discussion on the matter. The Senate of Pakistan made another crucial reform by revamping its website, and making it more open, transparent, and accessible. PILDAT applauds the new additions to the website, including live webcast of proceedings, detailed information on business of the Senate, availability of a provisional calendar, and details regarding the pay and allowances of Senators. Most noteworthy is the fact that the attendance of individual Senators in the House is now online. The Secretariat has taken one step further and begun to upload the attendance in Committee meetings, an initiative that is not yet taken by the Indian Rajya Sabha nor any Pakistani legislature. PILDAT commends the Senate’s initiative towards reducing the gap between Parliament and the people by creating a Public Petitions Portal. Citizens can file the petitions related to public issues on the website which can then be taken up in the House or referred to a committee. The Secretariat even allows petitioners to track the progress of their petitions online. Within three months of launching this portal, 554 petitions were received by Senate, 20 were selected for discussion in the House and 169 were deferred to Committees. It is critical that these initiatives do not fall through the cracks with the completion of the tenure of Senator Raza Rabbani as Chairman. A number of important practices, such as the compilation of Senate newsletters halted with changing tenures. PILDAT welcomes the introduction of draft rules of a Code of Conduct in January 2016, compiled by the Senate Committee on Ethics. A Code of Conduct will surely set standards of conduct expected from all members, as is an established practice in Parliaments around the world, including the Rajya Sabha and the British House of Lords. A Code of Conduct would not only control the behavior of Parliamentarians but also foster public trust. PILDAT strongly believes that a Conflict of Interest provision be included in the Code of Conduct. MPs are likely to have occupations beside politics, such as being business-owners, farmers, etc. that result in them holding interests outside of their roles as legislators. PILDAT recommends that MPs declare all financial interests that may potentially create a Conflict of Interest between their duties as legislators and their personal interests. A Register of Members’ Financial Interests that is used in Indian and British Parliaments may be emulated in Pakistan to compel Parliamentarians to vote and deliberate in the interests of the public. A register would diminish accusations of Conflict of Interest, and also uphold the legitimacy and integrity of the work of Parliamentarians.